While financial fraud and schemes can hit anyone, seniors are among the most vulnerable. Unfortunately, aging adults are the main target of a growing number of scams, including identity theft. And the resulting losses of these scams aren’t small. Each year, the senior population loses an estimated $36.5 billion to fraud, according to a recent CNBC report. To help prevent fraud that targets seniors in particular, Congress passed a bill named the Seniors Fraud Prevention Act in 2013. However, scammers are still out there, preying on older adults. Read on for a look at how you can keep your aging loved one safe from scams. There are a number of reasons why seniors are targeted by con artists. 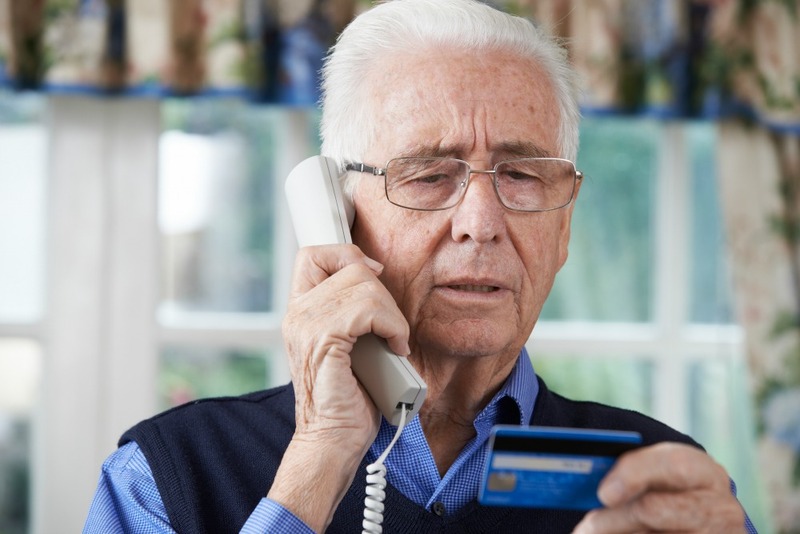 But one of the top reasons that scammers target older adults, according to Senior Safe & Sound, is that they’re typically unaware of the dangers of financial exploitation. Aside from that reason, scammers also target seniors due to certain age-related factors. For example, older adults tend to be less mobile and physically able when compared with their younger counterparts. This places them in a vulnerable position where someone can easily take from them without their knowledge. And even if seniors are aware, they’re generally less able to stop it from happening. And finally, because seniors are at an increased risk of loneliness and of developing certain conditions that cause cognitive impairment, such as dementia, they are often perceived by scammers as socially isolated, cognitively vulnerable, and naively trusting, making them a prime target for scams. With the types of senior-targeted scams in mind, let’s take a look at ways you or your aging loved one can protect against fraud. At Senior LIFE, we don’t just care for members’ health-related needs—we also provide help with emotional, family, and social issues. It’s often said that an ounce of prevention is worth a pound of cure. And the same applies to scam prevention. Stay involved in your loved one’s life. Check in regularly to ensure that nothing is out of the ordinary and that someone doesn’t have undue influence on his or her behavior and decision-making. Partner with your loved one’s financial institution. Set up a small bank account at a local financial institution for your senior’s spending so that his or her funds are in a secure account. Also, you can make arrangements with your loved one’s bank to receive account statements and alert so you can monitor for any unusual activity. Opt out of phone and mail solicitations. A lot of scams come through the mail or over the phone. You can help prevent them from reaching your loved one over the phone by signing up for the “Do Not Call” list. Similarly, you can prevent fraudulent mail from reaching your loved one’s mailbox for up to five years at a time with the Direct Marketing Association’s mail preference service. Embrace the benefits of digital transactions. Instead of having benefit checks mailed to your loved one’s house, use direct deposit. This simple step prevents your loved one’s benefits from being snatched from his or her mailbox or house. Put your research cap on. When your loved one wants to make a purchase of some sort, help him or her shop around—and carefully read any contracts or purchasing agreements before making a purchase. Take it to the shredder. Identity theft is a growing industry, to say the least. To help protect your loved one’s private info—like credit card numbers, social security numbers, and bank account info—use a paper shredder to destroy any receipts and other documents with this info. If you or your loved one suspect being the target or victim of a scam, rest assured you’re not alone in this. Senior LIFE is designed to help seniors live their best lives at home. That means not only ensuring their health needs are met, but their safety needs are met as well. That’s why we provide members access to not only the health services they need, but supportive services as well, including social services. After enrolling, all Senior LIFE members are assigned a care team—including a social worker, who is always available to connect you or your aging loved one with resources for seniors in the community. No matter what life throws at you as you age, Senior LIFE is here to lend a helping hand. As a caregiver, you want to ensure your aging loved one is able to live as safely as possible at home. At Senior LIFE, we go above and beyond to make that possible. To learn more about the unique services we provide, visit www.seniorLIFEPA.com/about.